Following the submission to Parliament yesterday, herewith an update on the events of the day and how this unfolded, including next actions and what you may expect. The initial presentations were done by PWC and then the South African Institute of Tax (SAIT), who both pointed out problems with the expatriate exemption being repealed. SAICA, next, we found strangely, indicated that they do not have a principle problem with the change, so this came as quite a surprise. SAIPA did quite a detailed submission on the problems with the change. A discussion followed and whereby the exemption proposal was given fuel by the DA who indicated that the principle of economically paying no tax is a problem. This was supported by the ANC and EFF. Even at Parliament level there was confusion as to tax on citizenship and tax residency. Professor Keith Engel, CEO of SAIT, then did a remarkable job in explaining some of the policy problems with what is being proposed, rebutting the adverse tide at that stage. Carel Gericke, head of tax on MTN and one of the strongest corporate tax minds in South Africa also stepped in to support the group’s cause and made well placed comments on the impact on costs for corporates and competitive consequences for South African corporates. Barry Pretorius and myself deliberately held back during this phase. Next was BASA, Capitec, Law Society and Webber Wentzel, who did not deal with the expatriate matter. We adjusted our presentation to make the points we believed were crucial at that stage. My presentation specifically explaining why this law change (a) adversely impacted the ability of South Africans to gain overseas work experience (b) the fact that South Africans are being driven away by this proposal and (c) the technical items on taxing of fringe benefits, double tax treaty relief and compliance costs, (d) cost of living etc. These are discussed in our technical submission which is available on the website and Expatriate Petition Group page. The points appear to have been well received. Barry Pretorius was next and especially his personal experience and examples hit home. He made it very clear that expatriates are being driven away and challenged why no other expatriates world-wide are being targeted by the same legislation. The video recording of his submission shows exactly how well he has done. They need more taxes and view expatriates as a potential source thereof, especially as many expatriates just stop declaring taxes anywhere in the world, submit zero returns to SARS, do not pay tax on investment income or capital gains tax. There are clearly many bad apples, ignorance of the law is no excuse, so they will now be targeted. The tax law as now proposed is probably overly harsh, they get our points hereon and this will be looked at during consultation. There are National Treasury meetings scheduled next week (4th onwards) where this will be unpacked and one will have a better sense of outcome then. As National Treasury conceded to problems with the proposal, my response was swift and thanking them for hearing our concerns, allowing consultation. Barry Pretorius then provided a very strong rebuttal and the chairman afforded him to well overstep his allocated time, a privilege not bestowed on anyone else. This was also recorded. He made very clear that the Committee requires stronger action from SARS on tax evaders and those not compliant. The seriousness of this cannot be stronger emphasized and his words were that the Committee “wants to see taxpayers in jail”. He asked why the DA received all the submissions and no-one emailed him, but he also indicated himself smart enough to guess why. This appears at least tactically something which could have been done better. There was a significant personal contribution by him to encourage National Treasury to “consult” hereon, consider delayed implementation and come up with a more workable deal. My personal view is that this was very successful. Plenty of small details are being dealt with herein, but to get National Treasury and SARS to re-think their draft law is rarely done and as we have seen with E-Toll / SANRAL, they do not like changing course. As they are now on record, they will consult hereon and recommend a more balanced outcome. 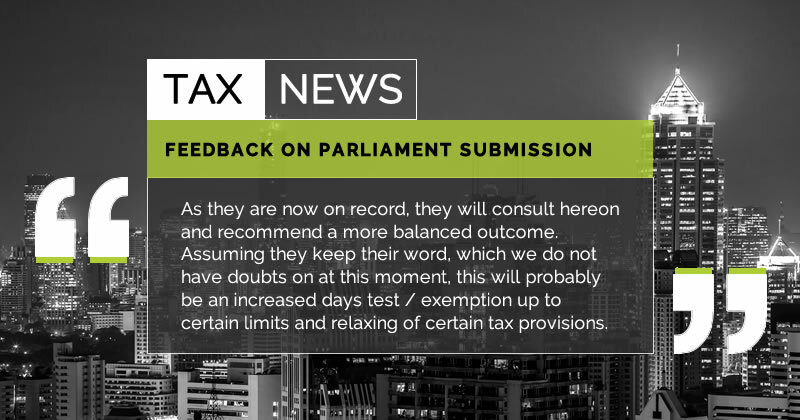 Assuming they keep their word, which we do not have doubts on at this moment, this will probably be an increased days test / exemption up to certain limits and relaxing of certain tax provisions. The message, however, is also that the complete expatriate exemption of the past will be no more and every expatriate should make sure their record is compliant and that they have properly exited where their intention is to become non-resident.